Ground chicken recipes aren’t easy to find and when I did find one, I didn’t like the fact that they were fried (probably dried out) and then dipped in uber-sweet peanut sauce. So, I made my own recipe for ground chicken and it was AMAZING. What else can a girl with ground up chicken thigh meat do other than get creative? Instructions are in each photo. Prep the parsley by cutting the bottoms off and then cutting it in half. Put it in the blender with the garlic and onion. Using the automatic pulse feature on medium strength, cut the onion, garlic & parsley until they are fine (as pictured). In a large bowl, combine the herb mix, one egg, the chicken, salt & pepper and the chickpea flour (or breadcrumbs if you like gluten!) Mix with your hands until well blended! Make burger meatballs and set on the side. Combine the simmer sauce and heat on medium until it boils and then reduce the heat. Cook 12-15 minutes until the outside of the burger ball starts to brown and then gently flip over. Forget frozen chicken wing appetizers – you can do your own just as easy and much cheaper. Using just a few ingredients and frozen chicken wings, you can have a fun, visually appealing main dish, snack or appetizer to make on the fly. No defrosting required and unlike store bought appetizers, no artificial colors, flavors OR preservatives. Just good ingredients, a little bit of time and there you go! 1. Marinade the fully frozen chicken wings (separated) in the garlic, honey, soy and sesame oil in a deep (at least 1.5 inch) baking dish. The amount of marinade depends on the amount of chicken – you don’t need much to start with. 2. Bake in an oven at 325 degrees until they start to brown. When they start to brown, turn them over. The wings should be cooking in liquid now, so they’re not just baking, they’re roasting and softening into fall off the bone wings! Add some soy if there is not enough liquid. Sprinkle with sesame seeds once they are browned. Chicken Wing TIP: You barely have to worry about burning wings when you do them slow roasted style in plenty of liquid in a deeper pan, like in the recipe above. The liquid protects the wings and the long slow cooking tenderizes the chicken. Salmon can be easy! Follow this simple salmon recipe and you’re guaranteed success. I’ve included not just the recipe, but tips to make sure your salmon turns out just right. In a small roasting pan – not much bigger than the salmon fillets, put your fresh or thawed salmon. The pan MUST not be large! For easier clean up, line the pan with parchment paper. Add the juice of one lemon and soy sauce until there’s about 1/4″ of sauce in the pan – this is the key to not overcooking! Sprinkle with ground pepper, cover with the lemon skins from the squeezed lemon and bake. Add a dollup of butter if you want. Since salmon varies in size, cook until the edges start to brown. One reason why salmon recipes go wrong is because they assume all salmon is the same size – it isn’t. Nor is it always the same fat content. Watch for it to brown, then it’s done! This one is done, but paranoid me had to check it anyways – oh well:) ENJOY! Broccoli is one of the tastiest vegetables if you cook it right. The key to broccoli is flavor. 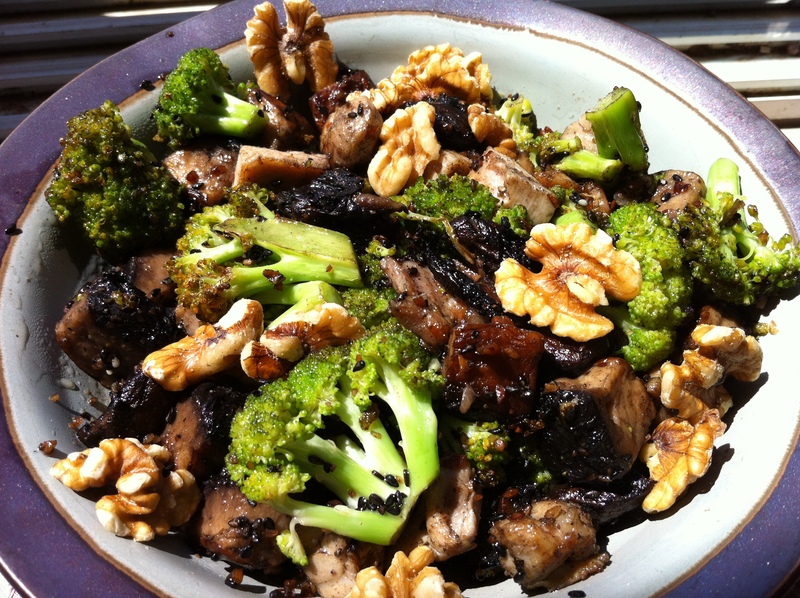 In this recipe, I use aromatic spices, Sriacha sauce and the unami of mushrooms to make a delicious and healthy dish. I added the walnuts for a bit of bitterness and because walnuts are healthy! If you like broccoli very lightly cooked, take it out when it looks like this! Walnuts TIP: Walnuts are one of my favorite nuts. They’re so darn healthy and so tasty. Walnut nutrition is here. Broccoli CAN be tasty when you dress it up right. This simple recipe does the trick in the healthy way. Mushrooms are good for you, but did you know they have been shown in lab studies to lower cholesterol and mediate the effects of saturated fats? You probably know about sesame seeds, you might not have tried black sesame seeds – and you definitely should since they’ve been shown to lower blood pressure. Walnuts have been attributed to slowing cancer growth and improving overall health factors, like blood pressure. And broccoli – not only does it prevent cancer it’s healthy (see nutrition info. after the recipe)! In a saucepan, heat the oil. 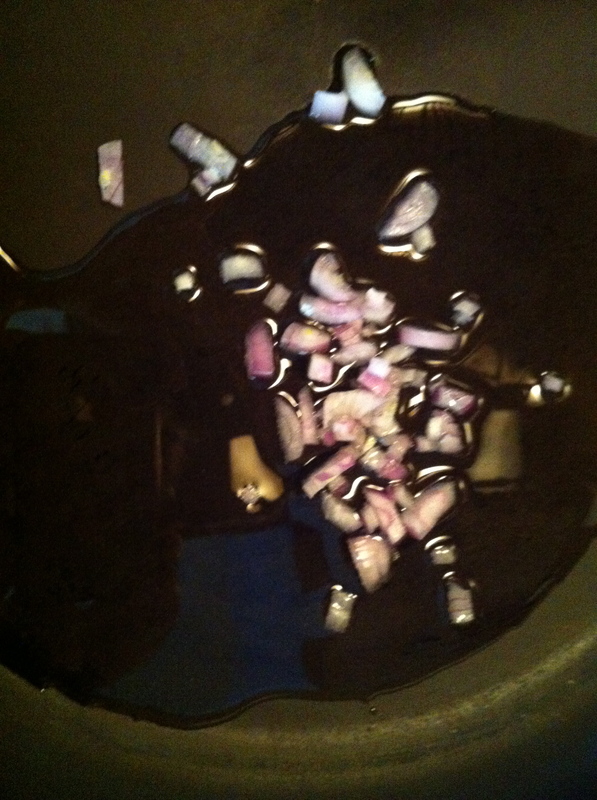 While it is heating, dice the shallot very small and put into the pan once the oil is hot (low-medium heat). Don’t worry about uniformity, we’ll be browning them and caramelizing them. When your shallots are getting started, get chopping on your mushrooms and broccoli. Cut into 1″ pieces. When the shallots are still white, put the broccoli in. Keep stirring and put the mushrooms in when the shallots are translucent. Now add the 2 Tbs of sesame oil – if it seems like there is not enough oil, you can add more sesame oil and/or add more coconut oil. Stir for a few minutes and watch to make sure nothing is burning. If it seems like it’s burning or the oil is smoking, turn down the flame. 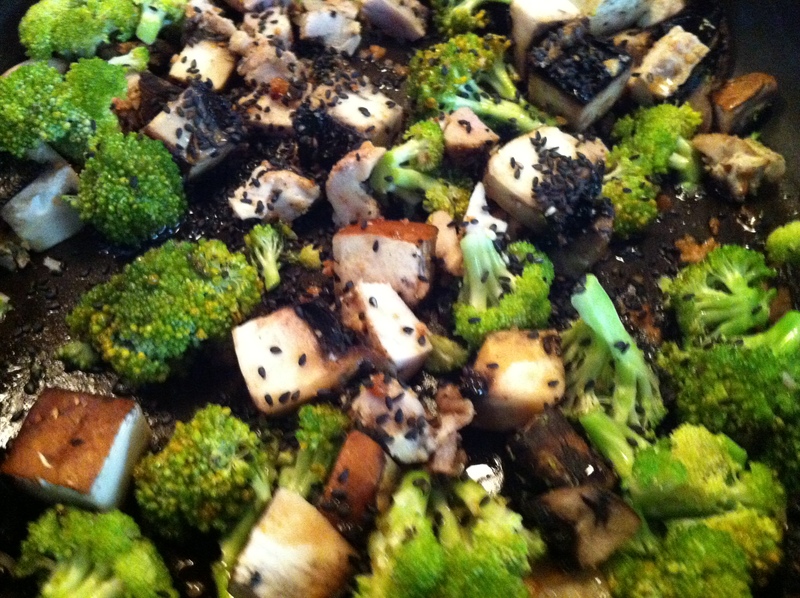 When the broccoli is starting to be cooked, add the black sesame seeds to taste and stir. The picture below could be done for some, for me I kept cooking a bit more until the mushrooms shrunk a little. 60 calories. No fat. Nearly no sodium. 12 g carbs, 6 g fiber, 2 g sugars and 2 g of protein. Stir Fry TIP: Sneak in leftovers. For a bit of protein, I diced up and added 4-day old chicken that was a bit too dry and not so tasty. I barely noticed it, but I’m sure my body appreciated the protein!